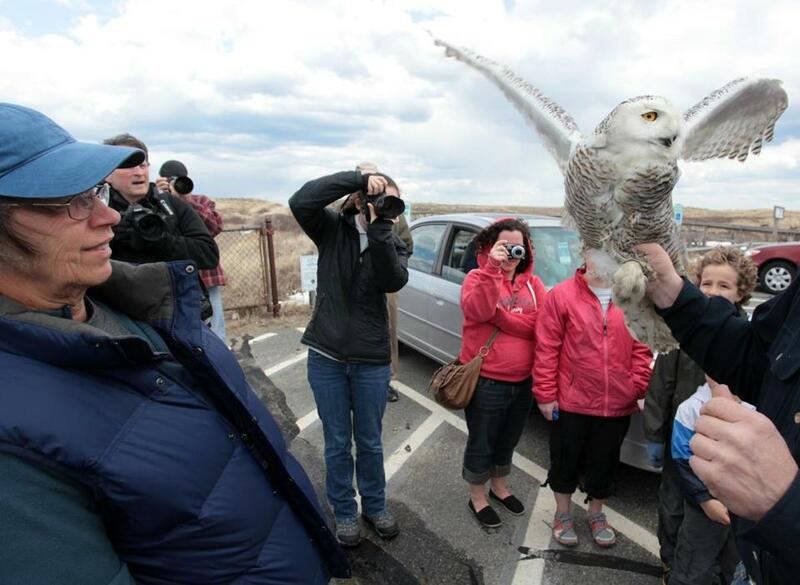 People cheered for snowy owl Century, released at Parker River National Wildlife Refuge. PLUM ISLAND — Norman Smith stood in front of more than 100 people on Plum Island Saturday afternoon with a majestic snowy owl in his hand. The owl, dubbed Century, was the 100th snowy owl captured at Logan International Airport, relocated, and released this winter. The crowd, many equipped with cameras and binoculars, counted down Century’s release. Smith, director of the Massachusetts Audubon Society Blue Hills Trailside Museum and an owl expert, let Century go. Her wings spread and rapidly flapped to elevate her high above the gathered group. The strong wind took her, and she glided gracefully out over the dunes and marshes of the Parker River National Wildlife Refuge until she was out of sight. Although Century was the 100th snowy owl captured at Logan, Smith said 36 owls were also caught in other locations, bringing the total to 136. Last year, Smith said, a total of eight were captured. The influx of owls at Logan poses a dangerous threat to planes. If pulled into an aircraft’s engine, a bird can cause a catastrophe. In 2009, a flock of Canada geese collided with a US Airways flight, forcing an emergency landing in New York’s Hudson River. It was revealed last year that officials ordered staff to shoot snowy owls at John F. Kennedy International Airport in New York after five of the creatures flew into aircrafts in the New York area within two weeks. Outrage from animal activists ensued, prompting a quick change by officials allowing live trapping and relocation. Logan, however, is by far the most popular airport for the arctic birds, which prompted Jeffrey Turner, a wildlife biologist with the United States Department of Agriculture who has worked at Logan Airport for three years, to put together a new protocol that is now used throughout the country to live trap and relocate the birds. Every owl caught for relocation is banded with a satellite transmitter — a lightweight device banded to the owl’s back to track its travels with a GPS signal. The small box does not cause the owl pain or discomfort, and the signal can last 11 years, Smith said. With the devices, Smith, Turner, and others can track each owl’s journey and study patterns. The oldest owl found with a transmitter was 16 years old, he said. Smith has been tracking the owls he catches with transmitters since 1997, which provide data on location, temperature, and altitude of each journey. He said Logan Airport resembles the dry, cold tundra terrain where snowy owls live in the arctic region. The airport is low, flat, with similar plant life, and is flush with small rodents, birds, and other mammals owls like to eat. The birds usually show up at the airport in early November and depart in early April. Of the 100 owls caught at Logan this winter, Smith said only one of them had been previously caught — an owl they had banded in 2010. There is no clear answer to why the relocated owls seldom return to Logan. Turner said the birds often vary their flight paths; Smith said that dominant owls stay in the northern areas, and most owls at Logan are younger. The less-dominant owls continue south, as far as Florida and Bermuda. Smith attributed the birds’ increase in population to “a great breeding year,” and said most of the birds they see make the 1,500- to 3,000-mile trip from the arctic regions are young. Century was probably born last June, he said. The owl weighed in at over 5½ pounds, the heaviest bird that they’ve caught this season. “They are amazing creatures for sure,” said Smith looking toward the dunes where Century flew away. Derek J. Anderson can be reached at derek.anderson@globe.com.